Seriously, how good is this leaderboard?! Exciting final day coming tomorrow @OMEGAGolfDubai. What a day for @Annevandan! 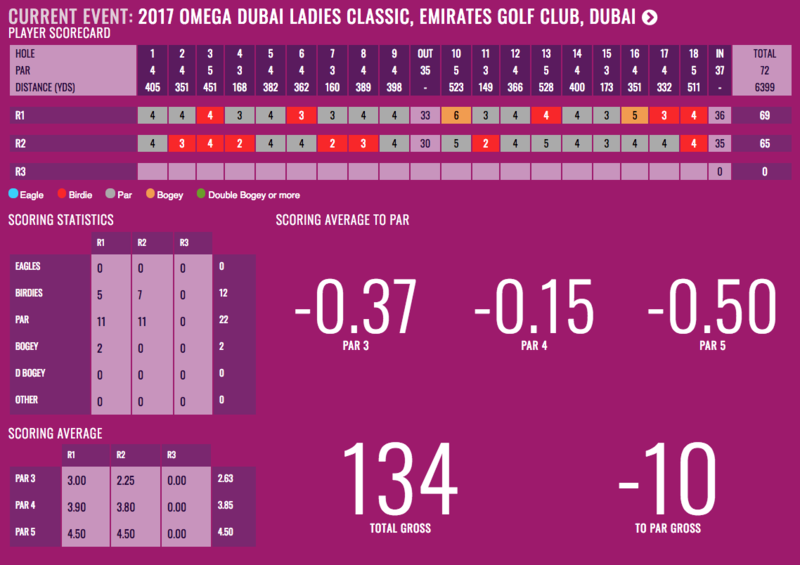 A change of putter worked wonders for long-hitting Anne Van Dam who blistered the front nine to move atop the leaderboard going into the penultimate round of the Omega Dubai Ladies Classic at Emirates Golf Club on Thursday. Starting the second round two shots off the pace, the 22-year-old Dutch star fired a flawless seven-under 65 to reach 10-under for the tournament, a good two shots ahead of Scotland’s Kelsey MacDonald. England’s Georgia Hall, placed 14th overnight, carded a sparkling 67 to join Australia’s Celina Yuan and Thidapa Suwannapura for a share of third on seven-under as overnight leader Supamas Sangchan slipped to tied sixth after returning a 71. Starting from the 10th tee, Van Dam set the tone of the day with a birdie on the 11th before making the turn at two-under. Five in seven holes sparked her round to life, putting her firmly in the frame for her second title on the Ladies European Tour. The previous day, a massive 350-yard drive on the 18th set her up for an 8-iron approach shot into the green and a comfortable two-putt birdie, however it was her putting which helped her move to the top of the leader board on day two.“I haven’t been putting great at all for the last half year, but I changed putters two days ago,” said last year’s Xiamen Ladies Open champion, 22, from Arhem in the Netherlands. “I went for something completely different. Normally I have face-balance and now I have toe-hang. It’s a blade, and normally I have a mallet.” Van Dam, ranked second in driving distance on tour, with an average drive of 278.60 yards, clearly relished the opportunity to compete in a long-hitting three-ball featuring Brittany Lincicome and Angel Yin, officially first in driving distance at 283 yards.